Currently, public engagement meetings are occurring (view the schedule and locations here), as well as the Facilities Assessments (where individuals from the contracting company go into each school building and assess the needs and capacity). There is overcrowding all across Region 1 (and Region 2, for that matter, but I’m simply dealing with Region 1 at this point). This is why new construction and renovations of old buildings is necessary. This is the current breakdown of individual trailers and four-room trailers (“quad structures”) across Region 1. Schools in the Cross Keys Cluster are the most overcrowded. SPLOST V dollars need to be spent to address the appalling conditions in the Cross Keys cluster, but since any allocation of money should be spent in the most effective way, I think it only makes sense to address the overcrowding that is occurring across the region. Providing a costly solution in the short term that will then need to be re-addressed in the next few years is an unwise use of funding and an unnecessary waste of time – not to mention an additional disruption to student and family lives. * No data was available to evaluate SPLOST I. SPLOST dollars were obtained through the DeKalb County School website. Now (below), look at how far kids in the Cross Keys cluster travel to attend school compared with the other high schools in the area. It doesn’t make sense to go to a high school ten miles away when there are multiple high schools that are geographically closer.`The fact that many of the past decisions were made piecemeal is one of the reasons that Cross Keys has become such an “interestingly” shaped district. This time, let’s think about this with the future – as well as the present – in mind. Chamblee HS has 300 available seats, and Chamblee MS has over 100 available seats as of October 27, 2015. A simply redistricting to fill these empty seats would help alleviate the overcrowding in Sequoyah MS and Cross Keys HS (as well as shorten the travel time for students and families). This is something we can do as early as August 2016 — no need to wait for SPLOST monies to make this simple adjustment. 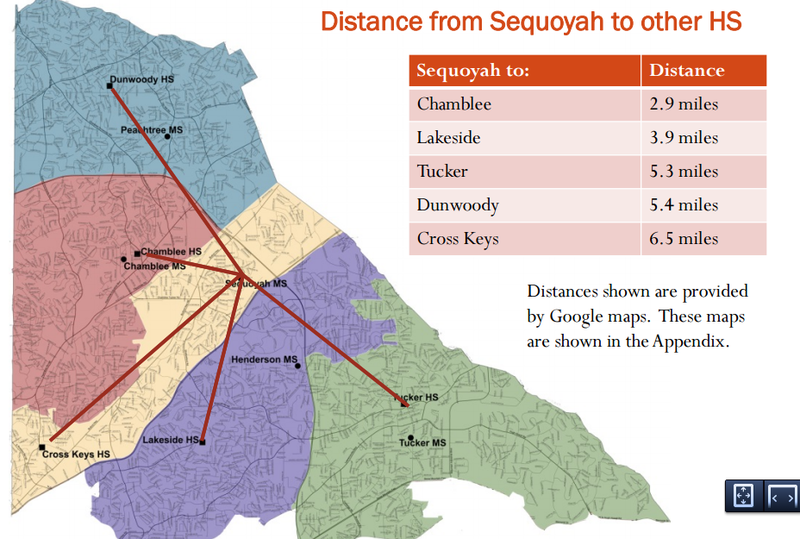 I think Dunwoody is way over and Chamblee way under (at least last year). Have you seen this chart? You have to be careful when re-posting information from DeKalb County Schools. It is frequently inaccurate, sometimes wildly inaccurate. 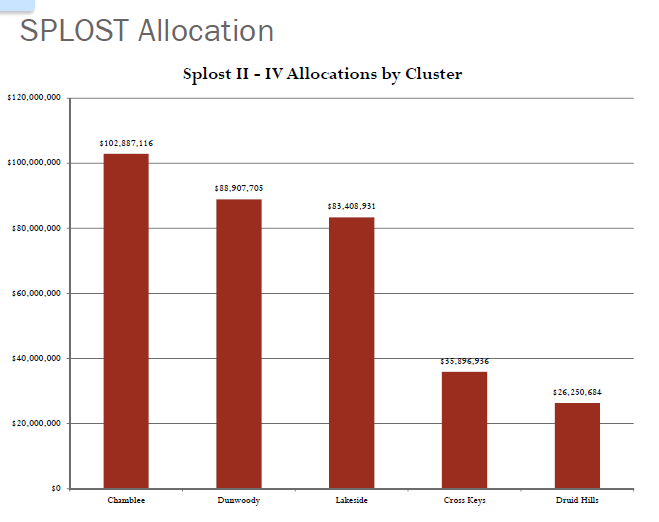 Also, the link for SPLOST IV information is not the most current Monthly Status Report and does not reflect any of the changes which have been made to projects since July 2013. I am not saying you are wrong. All of the large changes to SPLOST IV have been additions to projects outside of the Cross Keys Cluster. Just be careful to make sure you have the most accurate numbers possible. 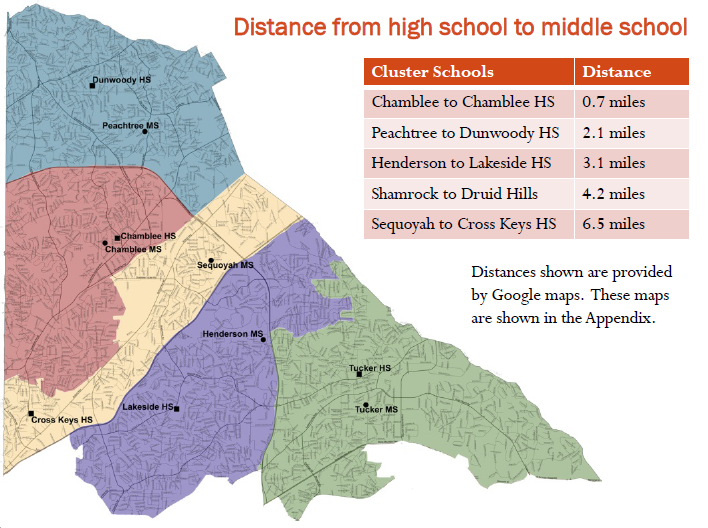 I will put together a table showing all of the schools in the Chamblee Cluster. The high school was under capacity, but will it be in three years? It is best to look at as big a picture as possible and to look forward, not back. Thanks, Kirk. I am working on getting the updated numbers from the county. These were the numbers from January 2015 that we were provided from Brian Bates when a few of us were serving as a schools task force. However, I know the numbers change every few months. I spoke with Dan Drake this morning and he told me that Chamblee HS is about 300 under-capacity and Chamblee MS is about 100 under-capacity. He also told me Dunwoody ES now has one trailer, something I haven’t seen in any report. I think you are a dreamer. That isn’t part of the plan. “Should” as in “it would be logically sensible and right.” Not “should” as in “it’s going to happen” lol.